The running community is full of amazing stories and people who have overcome serious obstacles to become the runners that they are today. When we hear stories like this on the television and in the newspaper we don’t realise that there are equally incredible stories within the group of people that we meet. One such person is Pól Mac Conleitreach. 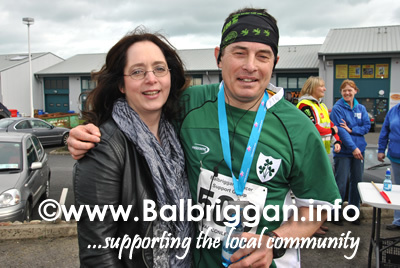 Pól from Newry ran the Balbriggan Cancer Support Group Half Marathon on St Patrick’s Day in Balbriggan. His story is both surprising and inspirational for two reasons, Pól had a kidney transplant in February 2013 and secondly it was the Pól’s lovely wife Catherine who was the donor! Pól & Catherine’s story also raises an awareness of donation, It shows how people can benefit and also shows that people who under go transplants can still live a fulfilling life afterwards..
A truly incredible couple. Well done Paul & Catherine!